If you are in the pursuit of mastering your kitchen recipes, you probably need your assortment of knives. Everyday cooking can become easy and gourmet class, if you pick the right knives. A boning knife is one such essential that lets you bring out the perfectionist in you. As the name suggests, it helps you remove the bones of fish, meat or poultry. It has a thin blade with pointed edge to get you right to the bone. Sharp and sleek, the best boning knife lets you have total control. With its special curvy design, boning knife is seamless around any bone to cut meat cleanly. Even the thinnest cuts are possible with boning knives. Let’s assume that you are searching for the best boning knife, what’s next? We give you an insightful analysis about what should know, if you want to buy the best boning knife. Boning knives have blades of varying stiffness and width. Your choice of meat determines the type of knife you would need. Narrow Knife: Expert chefs advise a narrow knife for ribs and chops. Wide Knife: It is preferable for chicken and fish. Curvy Knife: If your intention is to cut close to the bone, a curved knife is the right choice. Technically, any knife can let you remove the bones but it wastes a lot of meat and is far from perfection. You need thin and flexible blade for precise and fine cutting. You definitely have the edge when you are using a boning knife. The whole process requires less effort as compared to the struggle with a regular knife. While all of us want to pick the best boning knife from the shelf; there is a need for some homework before you step out to buy. Here is a snapshot of what you need to look for in a boning knife. Flexibility: Stiff knives give you a hard time working through thick cuts and boning large pieces. Flexible knives let you get seamlessly across fish fillets, chicken or lamb. Blade: There is a slight difference in the curve of the blade which might not even be noticeable for a novice. If one picks a straight blade, it will go fine with lamb but would be tiresome for de-boning fish. A curvy blade lets you fine cut across the fish in just one go. Size: On an average a blade size of 5 – 6.5 inches is most common in the market. 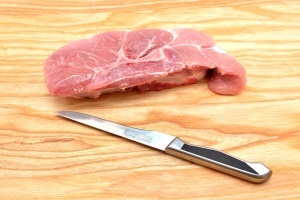 Pick narrow blade for lamb and beef while wide blade is well suited for chicken. You may even find knives as long as 8inch blade but that’s rarely used. Which is the best boning knife for your kitchen? There are a plethora of boning knives in the market. Let’s have a cursory look at few of the popular ones. The thin and sharp edged boning knife gives you superior precision and control. The blade is ice tempered with high carbon stainless steel to give you enhanced sharpness. Ergonomically designed Fibrox handles along with slip resistant material gives perfect balance and comfort. The design and size is versatile that lets you seamlessly de-bone meat, poultry and fish. It comes with a stamped blade that is quite popular among professionals. Overall, this boning knife is ideal for any type of meat and suitable for home cooks as well. The curvy and narrow knife is ideal for slicing through bone and cartilage. It’s ergonomic design with lightweight built gives you comfort and ease in the de-boning process. The curvy shape gives you better working angle while you are cutting close to the bone. The handle is comfortable and gives a fine grip. Its blade is semi-stiff for managing different type of meat. Overall, it gives you versatility and durability in one package. The fine blend of Damascus look and Japanese precision, this knife is extra curvy and narrow. Specifically designed for boning and filleting fish, its sharp design is most fascinating. The D-shaped handle and quality of material makes the knife distinct in its class. The blade has 33 layers of stainless steel to give uncompromising performance. The 6-inch size is ideal and safe for any novice. In short, you can pick this if you want to be an expert at filleting fish. Specialized for boning poultry, this knife has a narrow and flexible blade. Its blade is hand-honed for supreme sharpness and is made of forged high-carbon stainless steel. Handle is styled in a traditional fashion but is triple-riveted for lasting durability. It gives you good grip and comfort during usage and is also dishwasher safe. The extraordinary sharpness let you do your task with control and precision. It has the ideal dimension for any home cook or professional. This knife is the perfect choice for cooks who desire sharpness and precision. The curvy and flexible blade lets you work across boning process in detail. The upward curve and sharp edge makes it easy to enter and slice through fish and poultry. The handle is ergonomic and gives a good grip. The blade is thin with special focus on design to give a seamless performance. With the special sealing of handle around the blade, this knife is easy to clean and maintain. In a nutshell, there are a wide range of alternatives in the market and you have to understand your requirements. In order to pick the best boning knife for your kitchen, the meat type, level of precision desired and type of boning are the essential considerations. The endeavor of great cooking is definitely feasible if you have the befitting tools.